If you're a foreign visitor planning your first visit to the US, there are three things you should know. First, the place is enormous. My cheap transport suggestions are below. Second, while I've traveled quite a bit (several times to Russia, even more times to Turkey, Cairo-to-Istanbul overland, south-eastern China), it's my own country, the U.S., where I feel most at risk. Many of the huge number of "street people" are obviously mentally disturbed. In 1955 there were 340 public psychiatric hospital beds per 100,000 population. By 2005 that had dropped to just 17. The availability of institutionalization and long-term care for those who truly need it has dropped by a factor of 20. Most major U.S. cities have a large number of aggressive panhandlers. Many are obviously con artists, and some come uncomfortably close to using force. For example, the groups of youths in Washington DC — who angrily demand that they need a dollar. Egypt is the only place I've gone with a (just barely) higher level of constant panhandling and demands for baksheesh than Washington and Atlanta. Also, many cities have serious crime problems. They tend to have areas that are no-go zones. This has been steadily getting better since about 1990, but it can still be an issue. Ask at the place you're staying and heed their advice. Third, while I have crossed a lot of borders (Russia many times, Syria four times, the People's Republic of China four times), my most unpleasant border experiences — by far — have been inbound into the U.S. But once you get past the rude, clueless, and intentionally intimidating border guards, the locals are much nicer. The best bus rides in the U.S. are what are called the "Chinatown Buses", a sort of Sino-diesel Stargate system that quickly and cheaply links pairs of Chinatowns on the east coast. It's the cheapest way to travel between Boston, New York, Philadelphia, and Washington. Longer routes are opening, to Atlanta, North Carolina, South Carolina, and other places that aren't large metropolises with significant Chinatown areas. There is nominal service to Baltimore, but the station is far outside the city. Between Baltimore and Washington it makes far more sense to take the MARC commuter train — it costs around US$ 7-8 and it runs about every hour (but only Monday through Fridays, no weekend service). Megabus has started a U.S. operation, and sells some very cheap tickets for fast rides in nice modern buses. 53 U.S. — Ho ho, what great company! The U.S. was knocked out of the list of top 5 executors of its own citizenry by Pakistan's surge from 31 to 82 executions in 2006, but the U.S. still is ahead of oppressive medieval regimes like Saudi Arabia. See Amnesty International's report for the numbers. Greyhound bus terminals tend to be located in the most dangerous parts of the city. In some way, they may define the most dangerous spot. And, the Greyhound clientele tends to be, ah, interesting. When a US prison releases a prisoner (if your brother Elwood is not picking you up) you get a bag with the clothes you were wearing on arrival plus a Greyhound ticket. I've taken Greyhound six times for trips of 70 to 120 miles. On three of the first four, a passenger was thrown off the bus for some mixture of aggressive behavior and substance abuse. I guess that the good news is that they throw people off. Then there's the schedule inconvenience. I saw the itinerary for someone who had come cross-country from New York to Los Angeles. They changed buses in Chicago, Denver, and some other city, and in each one their bus arrived between midnight and 5 AM. My conclusion: Greyhound is part of some conspiracy to make America look bad to foreigners. But hey, Greyhound goes a lot of places, and it is relatively cheap. In some regions, the U.S. national train system Amtrak has excellent service. Especially the "eastern corridor": Washington — Baltimore — Philadelphia — New York — Boston. The west coast service is also said to be good: San Diego — Los Angeles — San Francisco — Portland — Seattle, although I've only ridden it between Los Angeles and San Diego. Otherwise, carefully check the Amtrak maps and schedules. Do not rely on the train sticking to its schedule. The problem is that Amtrak owns its own tracks only in the eastern corridor. In the rest of the country it has to use the tracks owned by the freight lines. 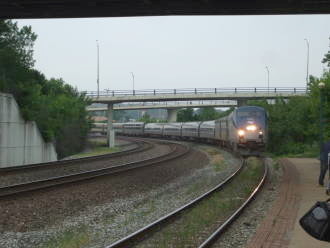 The track owners charge Amtrak for the use, but violate federal regulations by making Amtrak the lowest-priority trains. Amtrak trains frequently have to stop and wait for an opportunity to move. For example, it is quite common to leave Chicago precisely on schedule, but then sit motionless for an hour on the south side of the city waiting for a free space between freight trains. The Amtrak train "The Cardinal" from New York to Chicago pulls into Lafayette, Indiana. Check out automobile delivery. Retirees frequently want to have their car driven for them between, say, the northeast and Florida, while they fly. More commonly, car dealers will want a car delivered from a dealer in one city to where a customer wants that precise model. Search around on the web for this. You just have to buy the fuel and get the car there. You aren't allowed much time to stop along the way, but for transport between cities separated by a few hundred to several hundred miles, it can be a good deal. One of many places I've seen offering transportation services to car owners is autodriveaway.com. I've also seen about (but not used) the GishiGo ride-sharing service. If, on the other hand, you wandered in here looking for car and campervan rental in Australia, the best route to discover the country is the way of campervan road trip. Pick up a campervan from campervan hire Melbourne and drop off at campervan hire Sydney to enjoy the trip. Fun fact: In the United States it is illegal for an airline or airport employee to use the word "now". You will notice that you never hear the word "now", they always say "at this time" or possibly something even more pointlessly complex. This is because of federal law USC 3(14.1592), Aviation Industry Phraseology Opacity Requirements. Because of the same legislation, they are legally required to say "This will serve as a final and immediate announcement", something that no sane speaker of the English language would ever say. Other requirements, inserted into the regulations by the manufacturers of public announcement systems, require redundancy such as the commonly heard "All seat assignments have been assigned."